Sarge® Knives understands the importance of toting a quality knife and that is why they are committed to providing a wide selection of high quality cutlery for every imaginable purpose. Serge offers survival knives, folders, lock backs, fixed blades, and pocket knives. Whether you are outdoors skinning game or indoors preparing to cook for your loved ones, Serge has affordable knives sets for any occasion. Made from top-grade stainless steel, Serge Blades remain sharp even after many years of use. 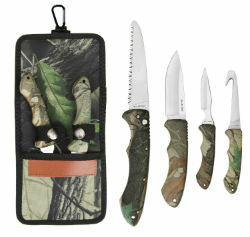 The kit includes: Drop Point Fixed Blade, Folding Saw, Caping Knife, Gut Hook, and Nylon Camo Pouch with Metal Carabiner.